Hossein Mousavian- Former Iranian regime nuclear official and present lobby for the regime. You can almost smell the desperation coming from the Iran lobby as it scrambles for an all-hands-on-deck effort to save the Iran nuclear deal before President Trump decides whether to withdraw from it by May 12. 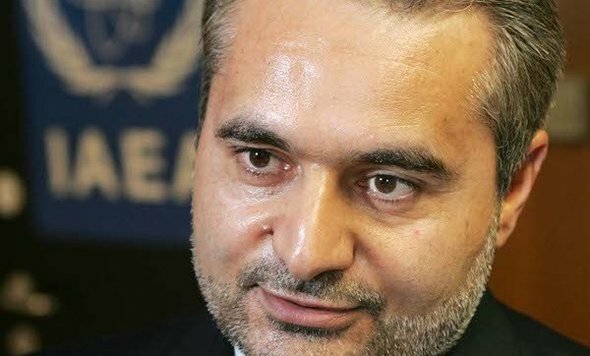 One of the dedicated warriors for the Iran lobby is Seyed Hossein Mousavian, a former Iranian regime nuclear official who wrapped himself in the cloak of academia at Princeton University as a faculty member. In an editorial published by Reuters, Mousavian takes up the gauntlet thrown down by Israeli prime minister Benjamin Netanyahu who earlier this week blistered Iran over its failure to disclose its nuclear program; calling the regime a liar. Mousavian diligently checks off the talking points the Iran lobby has been flogging lately; namely that it was no secret what Netanyahu revealed, Iran has been in compliance under the nuclear agreement, and that President Trump and his foreign policy team were leading the U.S. to war with Iran. He goes further by implying that the Trump administration’s “get tough” approach to Iran will not work. “Implicit in Trump’s approach is that he can bully and pressure Iran into meeting his demands. However, the track record of U.S.-Iran relations since the 1979 Iranian revolution leaves little room to believe that Iran concedes to pressure,” Mousavian writes. “I know from firsthand experience that Tehran responds to pressure by doing everything it can to produce leverage for itself. The modus operandi of Iranian leaders when it comes to addressing pressure is to become inflexible, steadfast and retaliatory,” he adds. Mousavian finally reveals the first bit of truth. The mullahs are inflexible, steadfast and retaliatory, but that is not how they respond to pressure, it is their normal course of doing business. For all of the cries of moderation by the Iran lobby during the negotiations for the deal in 2014-15, the reality has been a regime that have never wavered from its overriding goal of spreading its form of Islamic extremism at all costs around the world and build a Shiite sphere of influence protecting it from its many enemies. To that end, the regime has admirably stubbornly held true to that goal by leveling Syria, overthrowing the government in Yemen, begging Russia to join the Syrian conflict and controlling Iraq through Iranian-backed Shiite militias. Which is why Netanyahu’s central claim was never challenged by Mousavian and the rest of the Iran lobby: Iran has never deviated from its long-term plan to have nuclear weapons to use as leverage and a threat to its enemies and rivals. But where Mousavian and the rest of the Iran lobby get it wrong is in saying that these moves by the Trump administration will push Iran into full-blown nuclear build mode. The regime is already committed to such a path! Adhering to the deal doesn’t push them off their course. In fact, the appeasement policies practiced by the Obama administration have only made things worse. We have a track record of the past three years to show us exactly what the mullahs will do. What brought Iran to the bargaining table in the first place back in 2015? Mousavian and his allies would have us believe it was diplomacy. It was backbreaking economic sanctions imposed first by President George W. Bush and increased by President Obama, coupled with blocking Iran from accessing international currency exchanges which put Iran in the deep freeze money-wise. Add to that the fracking boom in the U.S. driving the global price of oil down fast robbing the Iranian treasury of billions in cash from illicit oil sales and you begin to see how the decision to come to the bargaining table wasn’t driven by some desire for political moderation, but knee-capping sanctions that threatened the very existence of the theocratic state. “If Trump withdraws from the JCPOA, he should not do so thinking Iran is vulnerable and in dire straits,” Mousavian said. It is plainly apparent to even a closet regime cheerleader like Mousavian the Trump administration doesn’t view Iran on the brink of disaster. Far from it. It views the Iranian regime as robust, growing and a menacing threat to the entire Middle East. The reason it is that way is because the nuclear deal held no restrictions on all other facts of the regime’s actions; allowing it to grow into the single biggest threat to global stability today. The only thing true about that statement is that those government demonstrations were a massive failure and a sign of the desperate nature of the mullahs’ predicament. It’s laughable that Mousavian ends his tirade by saying the end state for the Trump administration’s is war. The only war that is going to result from a withdrawal from the nuclear deal is an economic war as crippling sanctions are put back into place. Mousavian says if the president wants “bigger deals” with Iran, he should build trust by implementing the nuclear agreement. The reverse is even more true. If the mullahs want to avoid an economic meltdown that tosses them out of Tehran, they should build trust by burning their nuclear plans, dismantling their ballistic missiles and getting out of Syrian, Iraq and Yemen.